I tend to get lost in thought on the old farmhouse porch. I reckon there’s something to do with the mind expanding distant horizon view. Blue sky for miles. Beautiful green and golden rolling hills. The private peaceful observance of every new morning. Nothing beats the relaxation in the late afternoon after a days work in the city nor the still and quiet nights spent on the porch watching constellations and how they change with the seasons. The front porch is my favorite place at the farmhouse. Harvest time in September. The last few rows to go in the evening before nightfall. 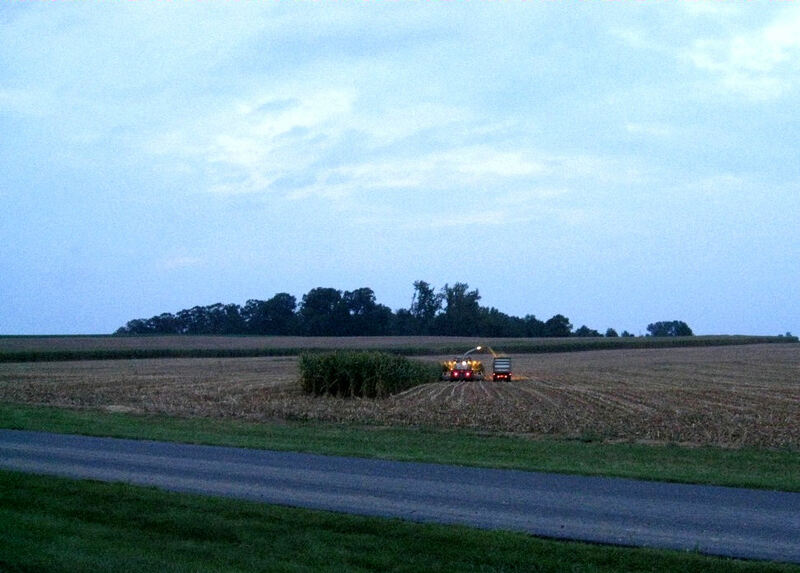 I enjoy watching the corn grow all summer and then the harvest in Autumn. It symbolically encompasses the cycle of life. Lately, with all the pondering I do on my porch, I’ve been wondering. After all this time, is there anything there? I wouldn’t know until I dug it and found out. Just like a question from Jeopardy. And that got me really thinking. It’s a very old farmhouse. Like many in western Lancaster County, it dates back to the late 18th Century. I’m not certain that the porch dates back to the 1780’s, or, if it was added on when the 1830’s addition was completed, or quite possibly later. There could have been many variations of it, as due to the 1830’s addition extending to the outer edge, it now runs the full length of the farmhouse. I would imagine there has to be some artifacts buried under there over time. But therein lies the rub; I can only imagine, as I have no idea what’s under my porch. This got me to thinkin’ about a subject I always come back to. Years ago, in my twenties, I read many books on quantum theory, I found these theories fascinating then and still do. And they all focus on the above mentioned probabilities. Back in the 1920’s, while whatever was under my porch was still there, some brilliant minds were at work coming up with new fangled ideas of how reality really works. Physicist folks like Albert Einstein, Max Planck, Niels Bohr, and Werner Heisenberg discovered that at a subatomic level, everything we see exists as both a particle and a wave. Classic Newtonian physics as we know them aren’t the same at a subatomic level. Everything gets a bit “fuzzy” when observed at the very smallest point of existence. These Austrian physicists also discovered that small particles, such as a hydrogen electron, exist in a “superposition,” meaning that it exists in all it’s states simultaneously. By attempting to measure this electron’s direction, you would only see it’s speed, and vice versa. Light itself, they discovered, exists as both a wave and a particle. Attempts to see light as a wave may show it as a particle, yet it exists simultaneously as both. You, as the observer, can only see one at a time, yet more than one exist. So, by simply observing, they discovered, you have caused the superposition to collapse into a definite. But it’s your definite. You have altered the experiment simply by observing it. You have now become part of the experiment. This causes what quantum theorists call entanglement. (And the issue I have with a true ‘objective’ reality.) This is the basis for what is referred to as Heisenberg’s Uncertainty Principle. It’s also called the Copenhagen Interpretation, due to Heisenberg’s being an assistant to Niels Bohr in Copenhagen during the years 1924 to 1927 when the theory was established. In all simplicity, according to quantum mechanics, reality is more subjective than objective, meaning you create reality by observing it. The answer according to Quantum Mechanics? There’s no forest, no falling tree, and no sound, unless you’re there to observe it. The easiest way to understand this theory is to consider a very sharp and curious physicist named Erwin Schrodinger, who, in 1935, thought up an absurd response to the Copenhagen Interpretation or Heisenberg’s Uncertainty Principle. Yes, mused Schrodinger, all that may well be true on a subatomic level, but, what about what we observe here on a macro level? He proposed a real chin scratcher and took this paradox to a larger scale. It’s an amusing thought experiment referred to as Schrodinger’s Cat. It goes like this: You place a cat in a sealed box, and in that box is a small radioactive particle that may or may not decay. If it does decay then a lever is tripped releasing a poisonous gas that kills the cat. But, suppose it doesn’t decay? With the box sealed and the cat inside, the cat exists in a superposition. It’s both alive and dead until you open the box and observe the cat in either of it’s states. Very similar to the particle and wave thing going on at a much smaller scale; again, the paradox, as you can’t see both states at once. Unless, of course, there were more than one of you. This theory challenges the outcome of the Schrodinger cat in the box experiment. This is the Many Worlds Theory, or what I see now referred to as Multidimensional Reality. I find this the most valid quantum theory. This scientific theory maintains that when the box is opened and the state of the cat observed, it still is both alive and dead, existing in both states. If it is the same on a small scale, then it has to be the same on the larger scale. This is where probable realities come into play like a path forking off in the woods. Reality forks off and there become two you’s. A you that has seen the cat alive and a you that has seen the cat dead. A simple example goes like this: for every decision you’ve ever made in your life, there are endless versions of probable you’s in multidimensional realities that have made the opposite or another decision. It’s infinite and quite fascinating to consider; the universe playing out every possible probability. I think it explains the wave and particle paradox too, as I cannot see what any of the probable other versions of me are seeing; I can only see the particle or the wave. I’m intrigued by the quote from Jesus in the New Testament: “In my Father’s house there are many mansions. If it were not true I would not have told you.” A very interesting coincidence in my opinion. The circumstancial evidence of the religious words “Many Mansions,” and the scientific words “Multidimensional Realities” quite possibly referring to the same thing is something that’s always fascinated me. Perhaps this proves the theory that time itself only exists here in this physical plane. That could easily explain why multidimensional reality outside of this physical existence is often referred to as “eternity.” What if, at the very base of physical existence, there is a border between physical and nonphysical? Consider again the hydrogen atom with its single electron existing in all its orbiting positions simultaneously. The moment you observe the electron when considering that it exists in every position possible at once, (and that is not possible in linear time) then there is no time until you collapse it at the point where you observe it, hence placing it into the physical state, (and your own subjective physical reality) where time runs in a linear fashion. So why am I applying quantum theories to my porch? Well, simply because the probable me in this reality wanted to. And, for an interesting reason, as you’ll see. 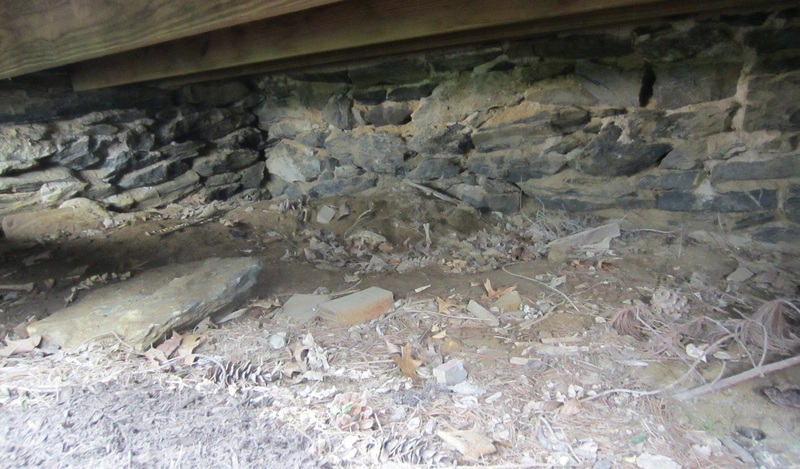 There are 2 separate chambers under my porch divided by a fieldstone wall about two feet thick. Each chamber measures approximately 5 x 12 feet. Above is the right corner of the right chamber. This is where I started excavating, and sifted my way to the other side. 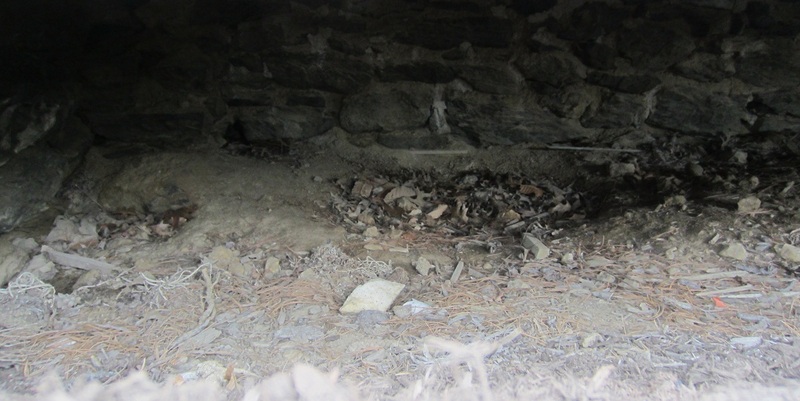 Above is the left side of the right corner chamber; this is the where the thick stone wall divides both halves. The almost two foot thick dividing wall between the chambers. I was surprised at the (probable?) opportunity to get this photograph as the steps were removed to be replaced just recently. I now exist in a reality that features new and very sturdy porch steps. The right side of the left chamber. Due to the confined view of the length of the porch, I was unable to get a complete photograph of each side, let alone make an easy way to enter, having to slide myself feet first on my back under each side with a foot or so of room as to not harm the mulched flower beds banked up around the porch. The left side of the left chamber. Past this on the left was the 1830’s addition to the basement. This ‘newer’ addition extends all the way out to the outer edge of the porch. This chamber is identical in size to the right one, both are approximately 5 x 12 feet. I first went under the right chamber to clear off the top debris and within 10 minutes found these. 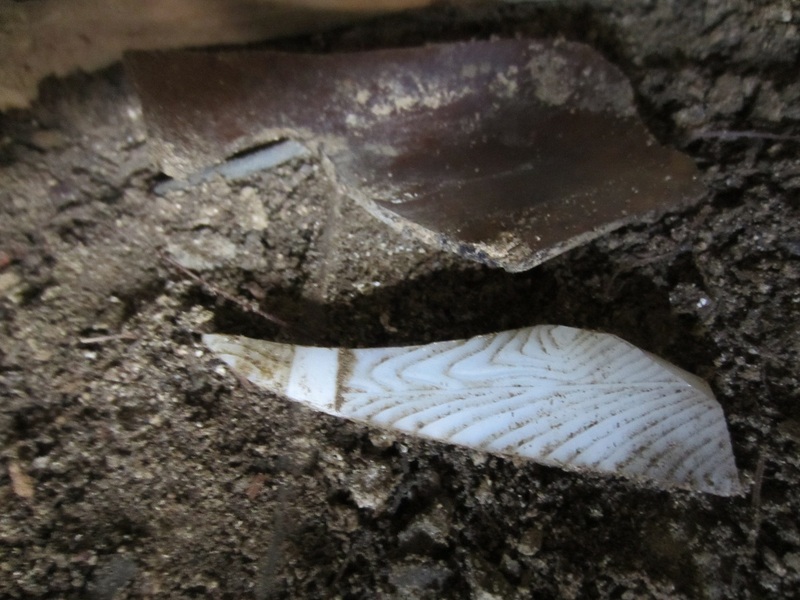 Above is a bone, a good sized fragment of an 1800’s amber strap flask and a unique fragment of opalescent white glass with a wood grain pattern. 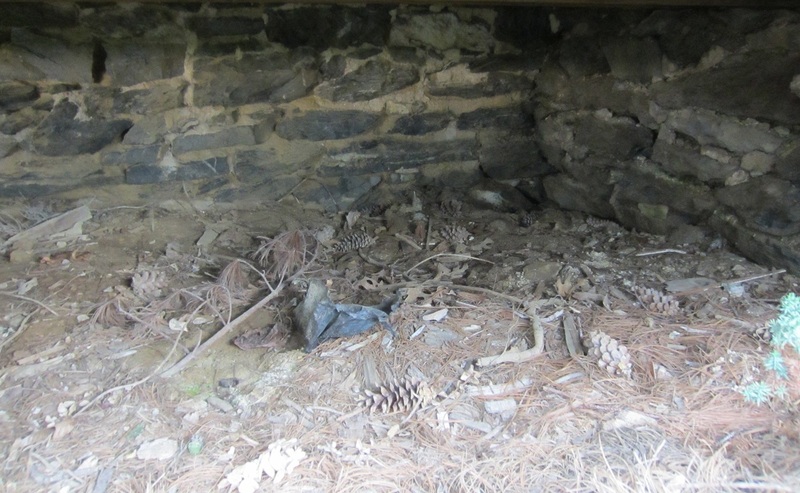 Many a critter had likely crawled under this porch to die. I would be inundated with bones, some from natural critters, others showing cuts from human meals. I would also be inundated by glass. 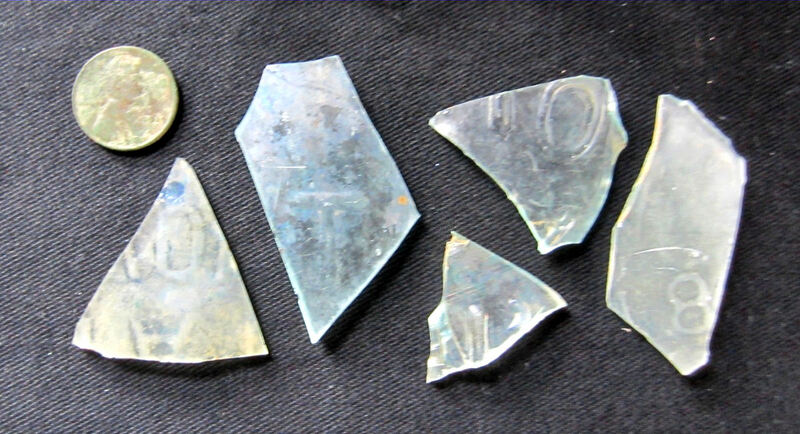 A close up of the first two fragments of very old glass. I was excited to see these at the top one inch level under the raked loose debris. Now I’m under the right chamber in the right corner with all my tools to entangle with the reality of what lies under the dirt and collapse this superposition once and for all. 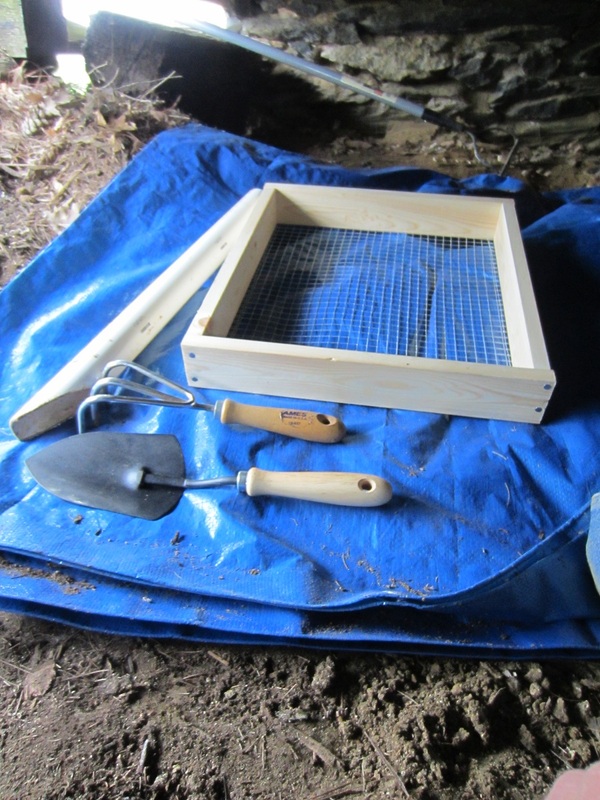 Starting in the very right corner, I began sifting the soil. The “above natural ground” porch dirt contained “signs,” which are indicative of objects that are there due to human interaction and not natural to the ground. These signs were contained within the soil from between 8 to 12 inches, I then determined below that was natural ground. This proved true for each chamber underneath of the porch. 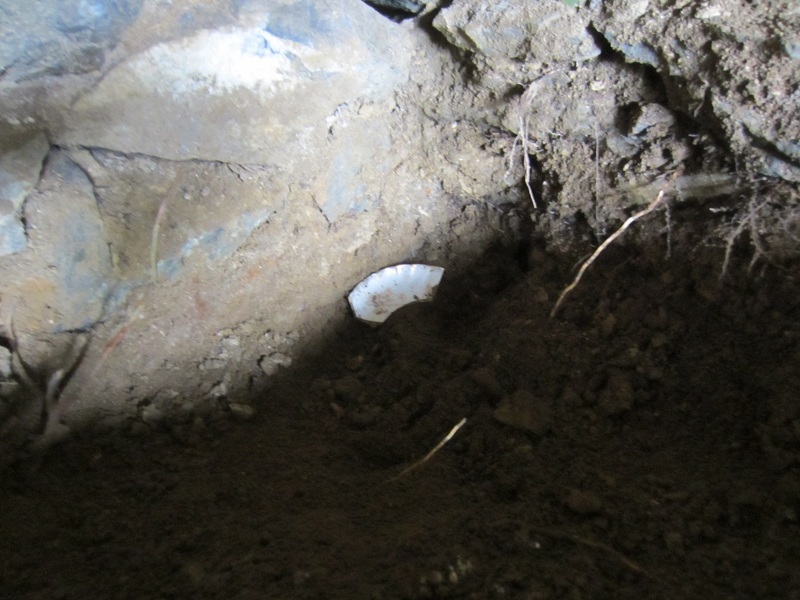 My first find under the soil shown below was to become a paradox unto itself as you will see. This wouldn’t be the only one; there was another one too. 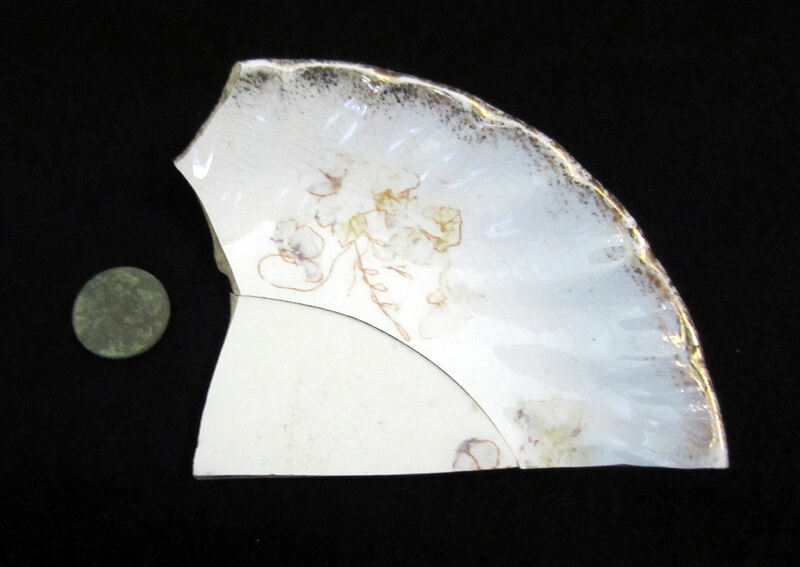 Above is shown as it was found, the side fragment of a scalloped gold edged porcelain small bowl with a floral pattern. 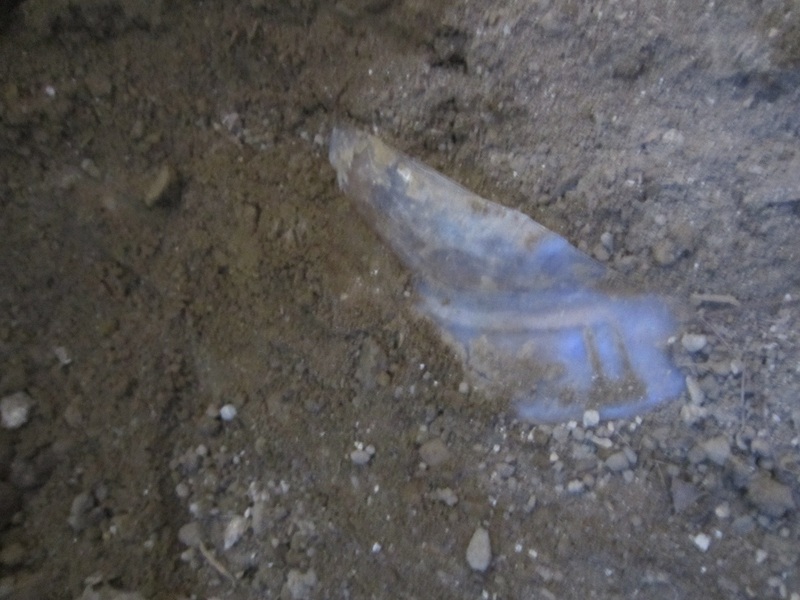 I found this in the far right corner of the right chamber, which would prove interesting as I found only this piece of this particular object in the right chamber. 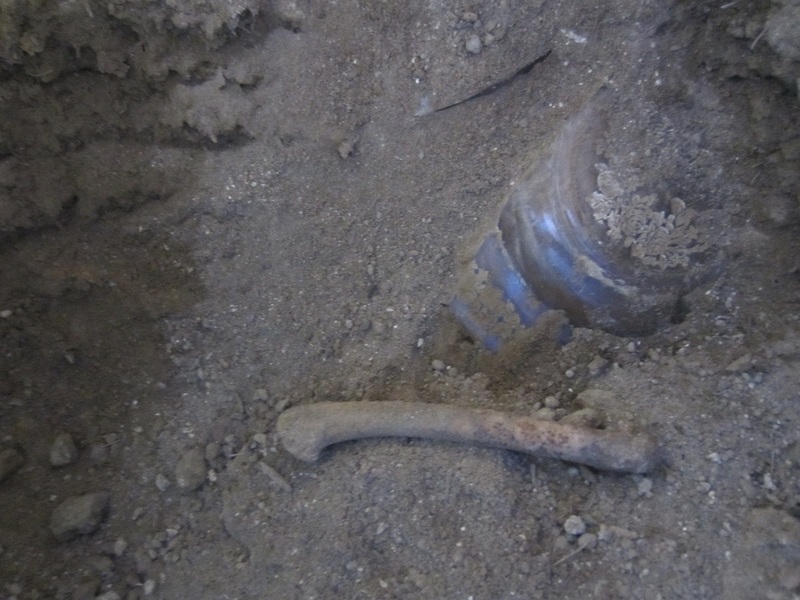 When I dug the left chamber I happened across the only other piece of it, which happened to fit. How can this have occurred? Why would separate fragments be so far apart, one in a right corner, and the other as shown below fitted together, found in the center of the left chamber just as deep? 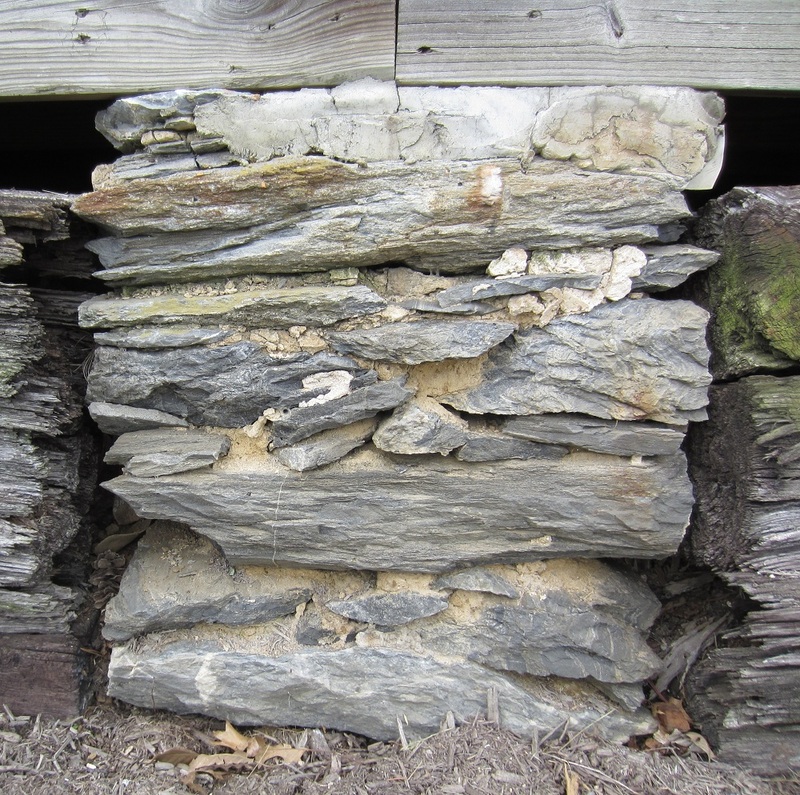 This was interesting as the chambers are separated by a fieldstone wall almost two feet thick. The fieldstone wall predates this particular type of china. Or does it? 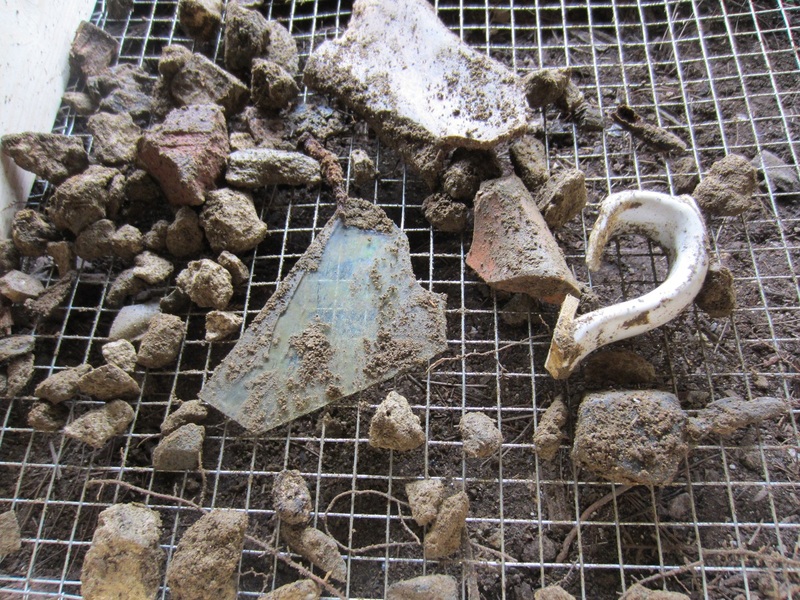 In the sifter is a handle to an 1800’s English Burslem ironstone chamberpot, an aqua window glass fragment of which, like the bone fragment in the upper center, I would be inundated with, and a fragment of old stoneware. I would find a bit more of this ironstone chamberpot as seen below. 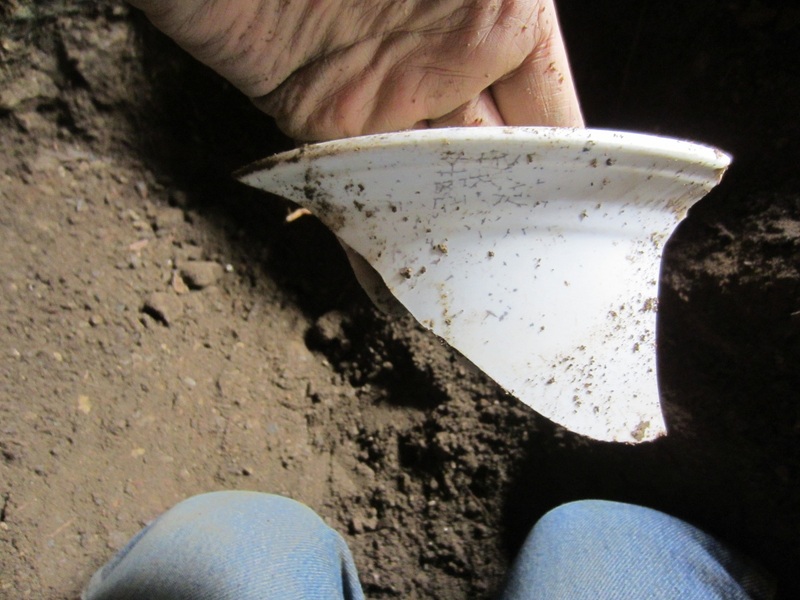 I had uncovered a good sized fragment of the top rim of the chamberpot. This wasn’t very far beneath the top surface. I would find older things lower down. I did not photograph everything as it was found, as I had my camera in a plastic ziplock bag and after a while it just became too dirty under there to use it without risk of harming the camera. This hasn’t seen the light of day in a long time. 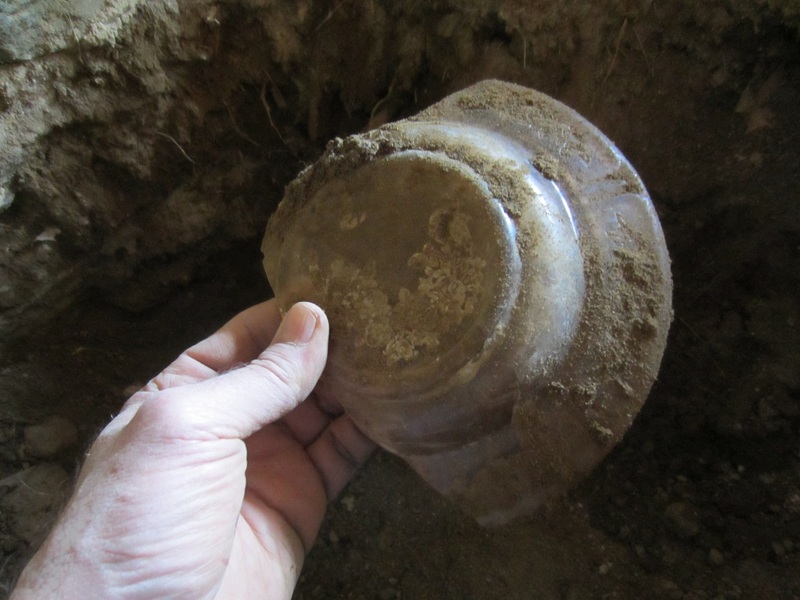 I was to find more of this chamberpot, but not the entire piece. Below are photographs of it cleaned and as complete as I found it. The handle fits to another piece and both photos show the main large piece connected with a piece on the lower right. 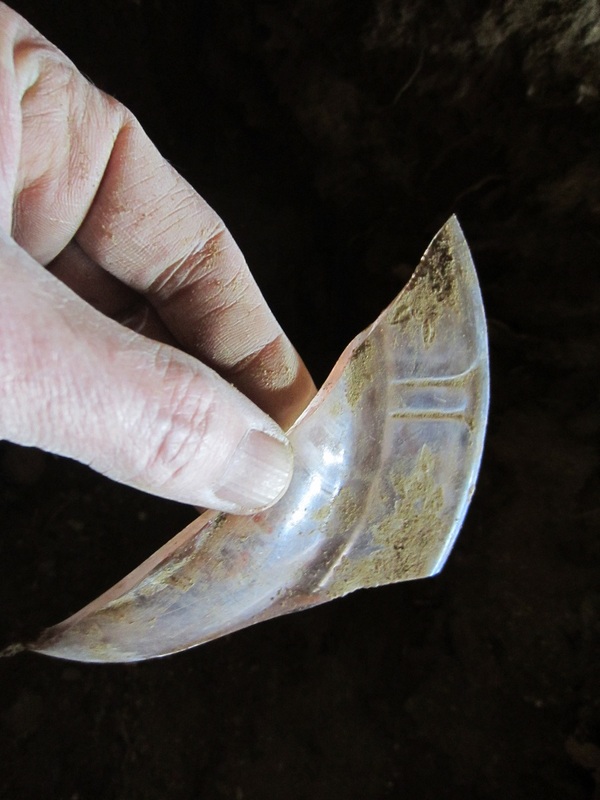 This remains of chamberpot was found in the right side of the right chamber. 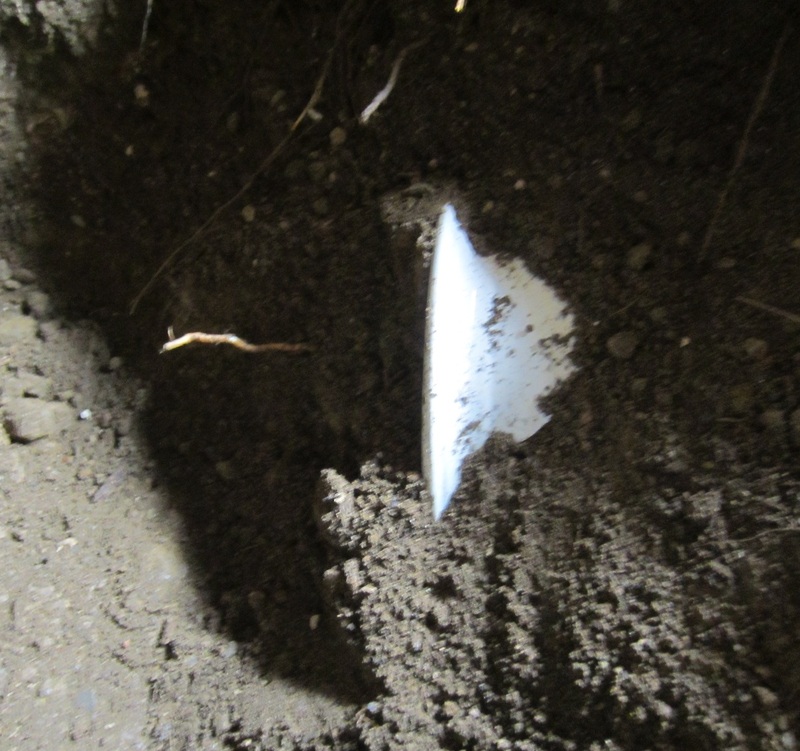 Almost directly beneath it was a much older piece of ironstone, a soup type bowl in many pieces. 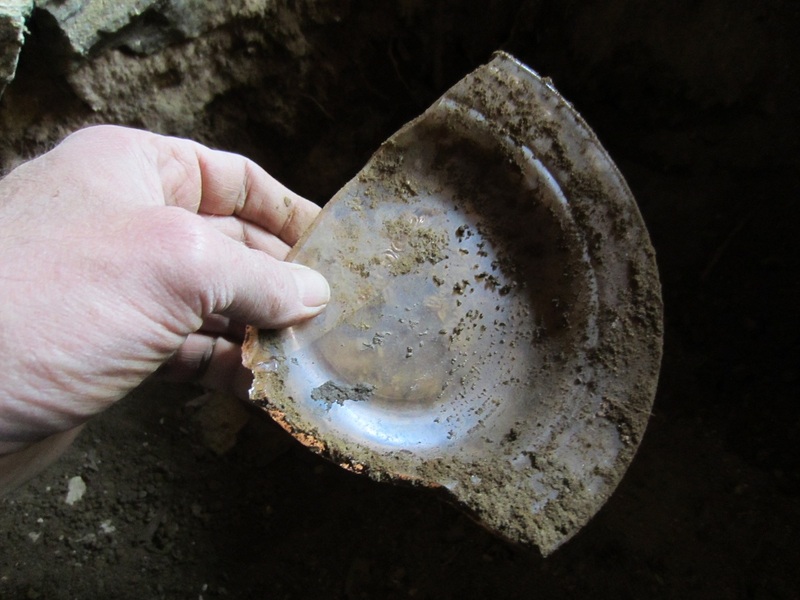 The pitting wear was very unusual and I was intrigued by finding both the chamberpot and this, but not every piece of either object was under the porch. The major large finds were incomplete, which made me wonder. 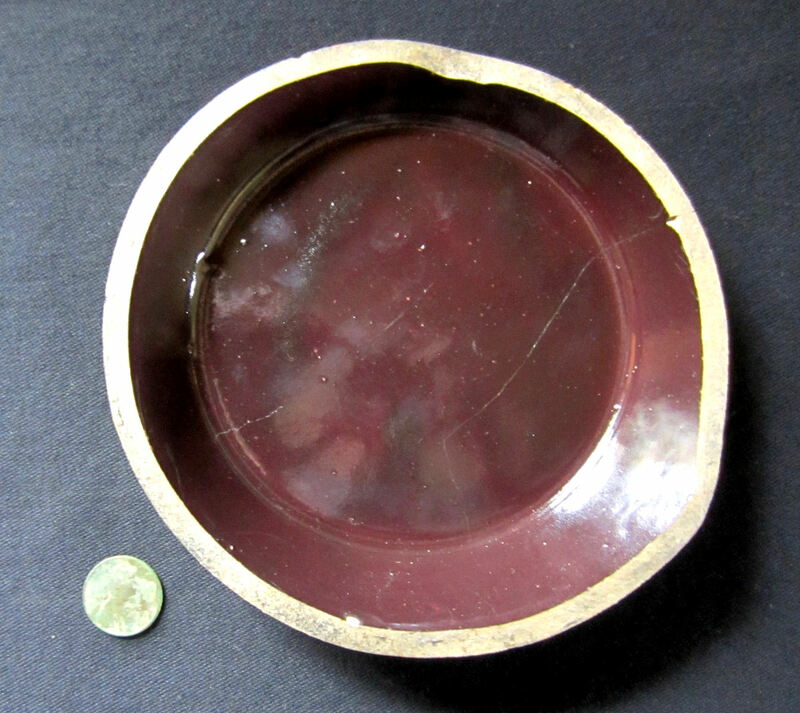 The wear is most unusual, this shallow bowl was either very well used past the glaze, or it aged like this in the ground. Below are shown the pieces that fit together. Note the lower right fragment that came from the other side of the porch. It features no crazing and has blue colored staining in it. 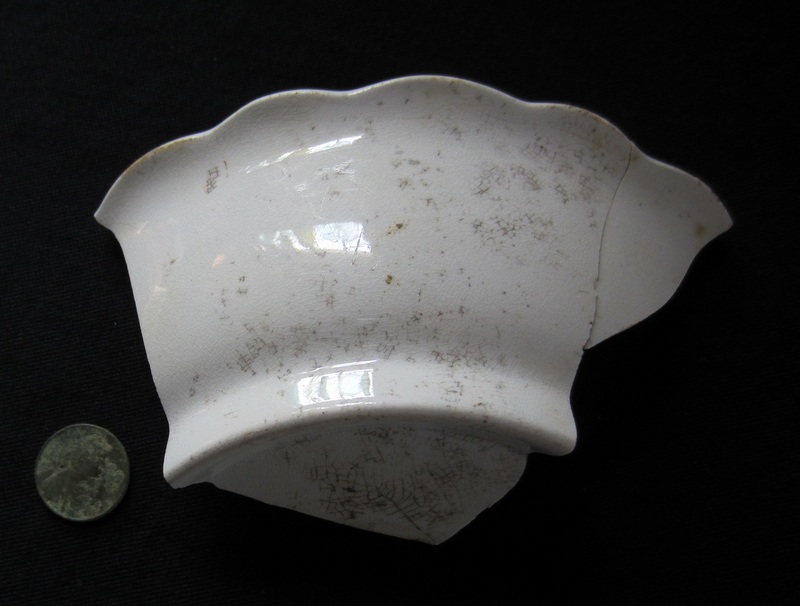 There were other pieces of ironstone, including a scalloped bowl shown below. 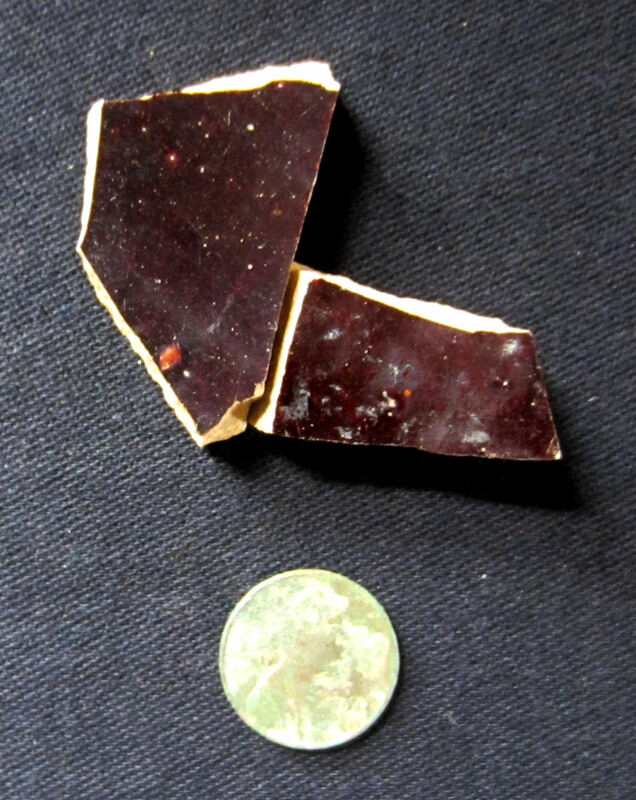 I was able to locate only these 2 fragments, shown below in bottom and top views. The coin is a penny used for scale. 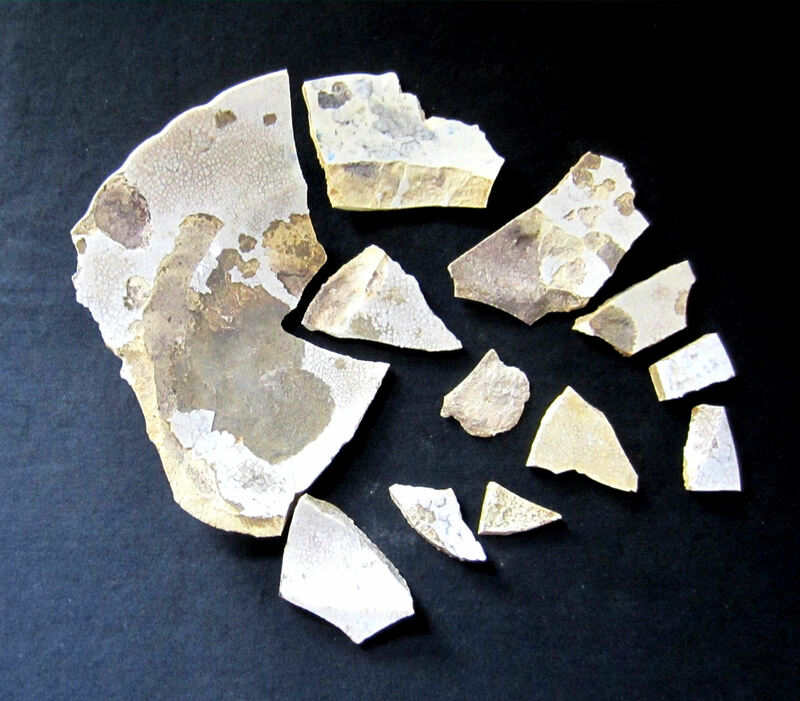 There were many fragments of a thick plate also; all of these came from the left chamber. Below is a photograph showing the first edge fragment coming into view. 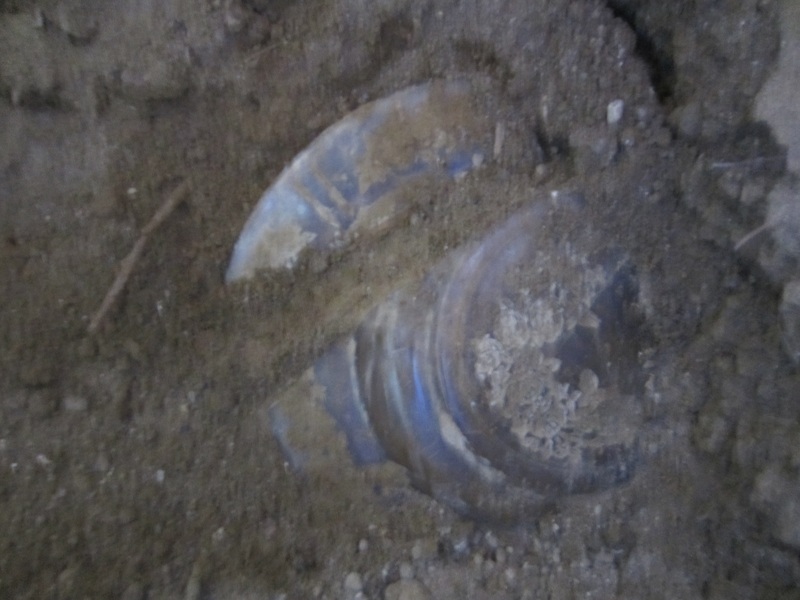 Holding the 1800’s ironstone plate rim piece at it came out of the ground. 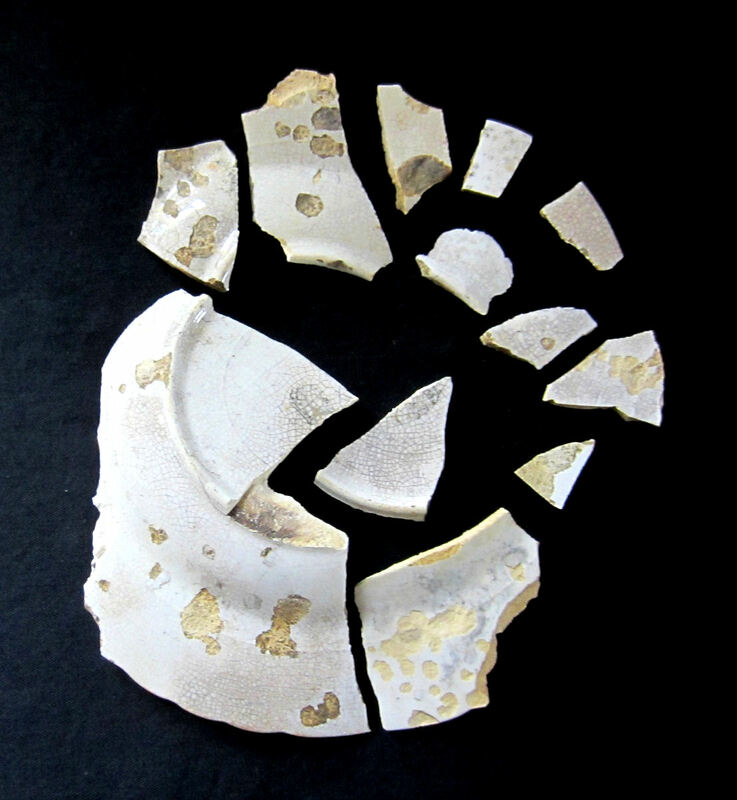 Shown below are the fragments of the incomplete plate. 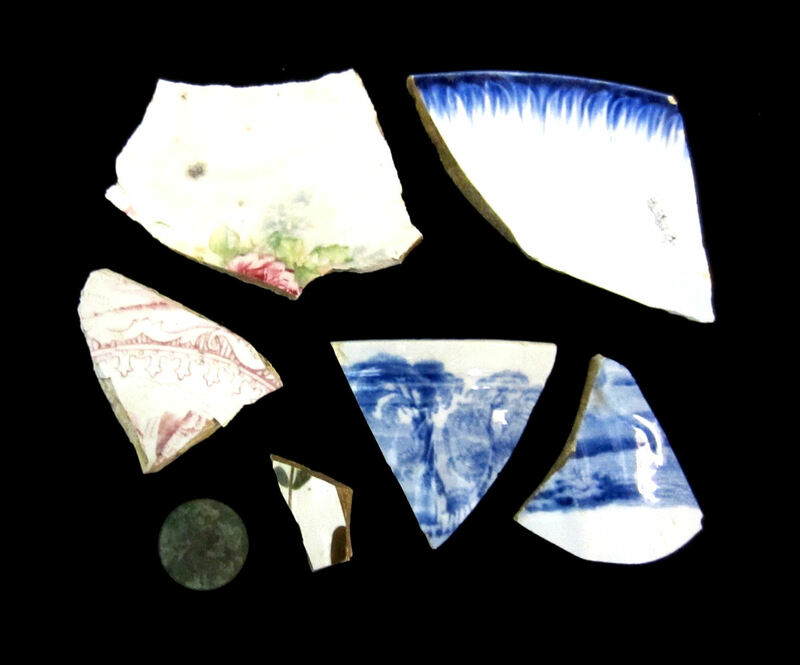 There were many other fragments of ironstone, some fit together, some may be from different items. I decided to photograph the various pieces as a grouping as seen below. 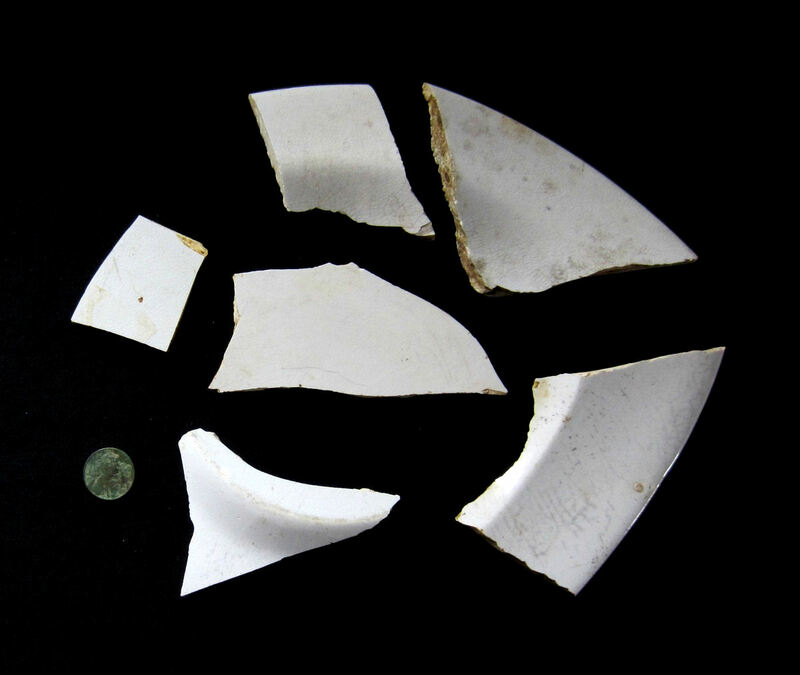 Along with the ironstone, there were china fragments of all sorts, but only singular pieces with the below photograph showing them with just one pattern of a bowl or cup that had matching pieces. Interesting how half, or almost complete pieces are unearthed and at the same time scattered individual fragments of various types. 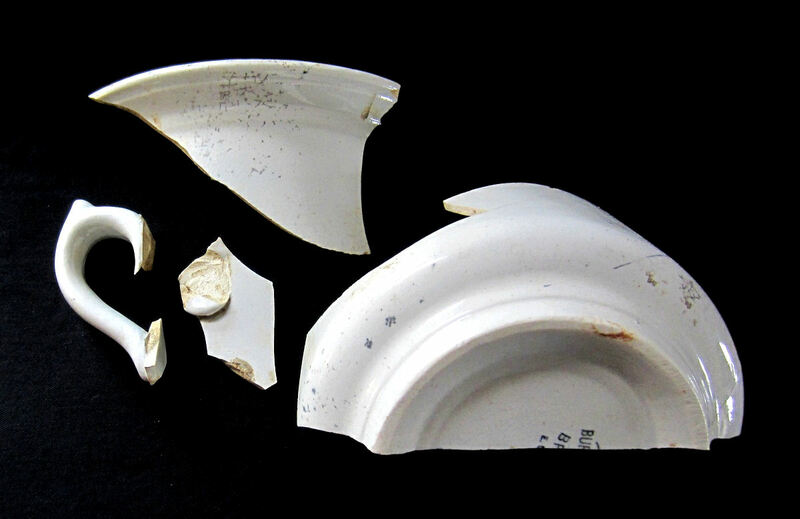 There were many different types of fragments of stoneware, including crockery, redware, brownware and two fragments of brownware with white glaze on one side. Shown below is the largest piece; a base signed E S & B, NEW BRIGHTON PA. These initials stood for Elverson, Sherwood, and Barker, who made all kinds of stoneware crockery in the latter 1800’s. I encountered this piece showing base up in the right chamber and was excited by the possibility that I had found a complete piece. But it was not to be. Only the base and no other pieces of it were located. The inside of the base. When I realized it was just that, I carefully lifted it out to find original contents of a pasty, gray silver material. I wondered if it were mercury or lead. 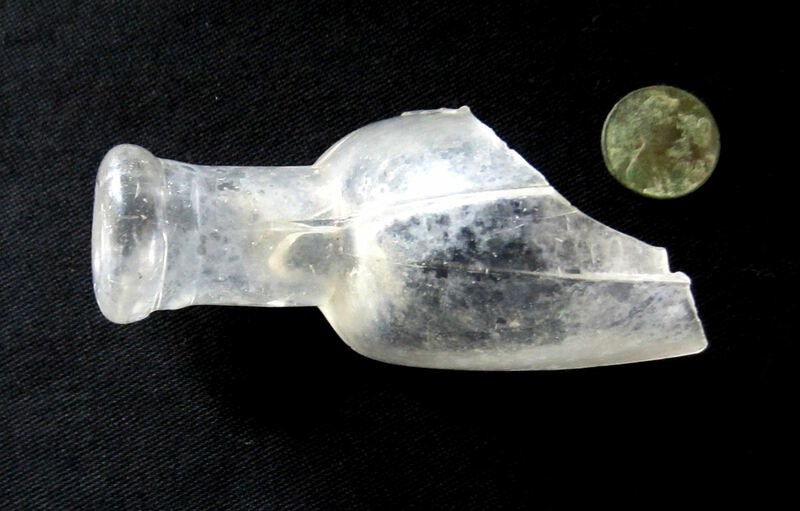 It resembled a “pewter paste.” It was very unusual, and unfortunate, as I was not able to photograph every piece as it was exposed and excavated. 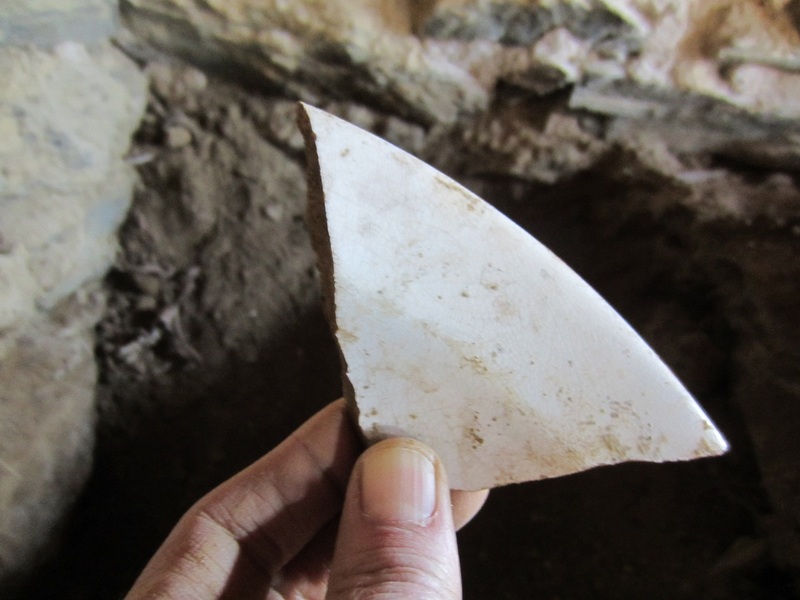 This was the only fragment located, not another piece of this crock was found. 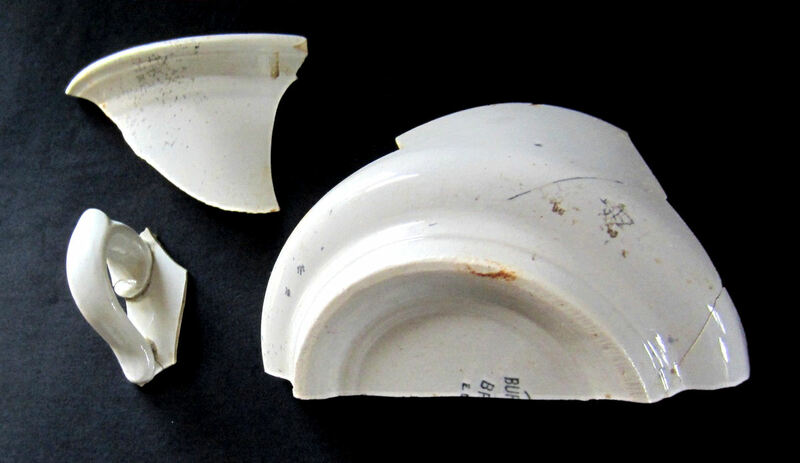 Above are two fragments of brownware with white on one side. These were the only two pieces of this type found and they actually fit together. The white side is shown below. 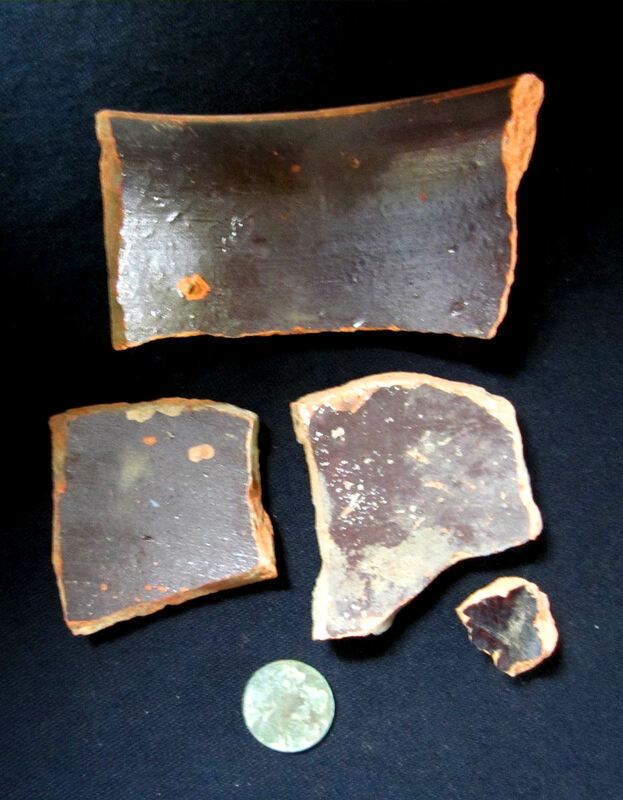 There were many other fragments of stoneware; shown below is a grouping of some redware. I found much too many pieces to photograph them individually. On the right chamber I found the only complete item, a bottle. 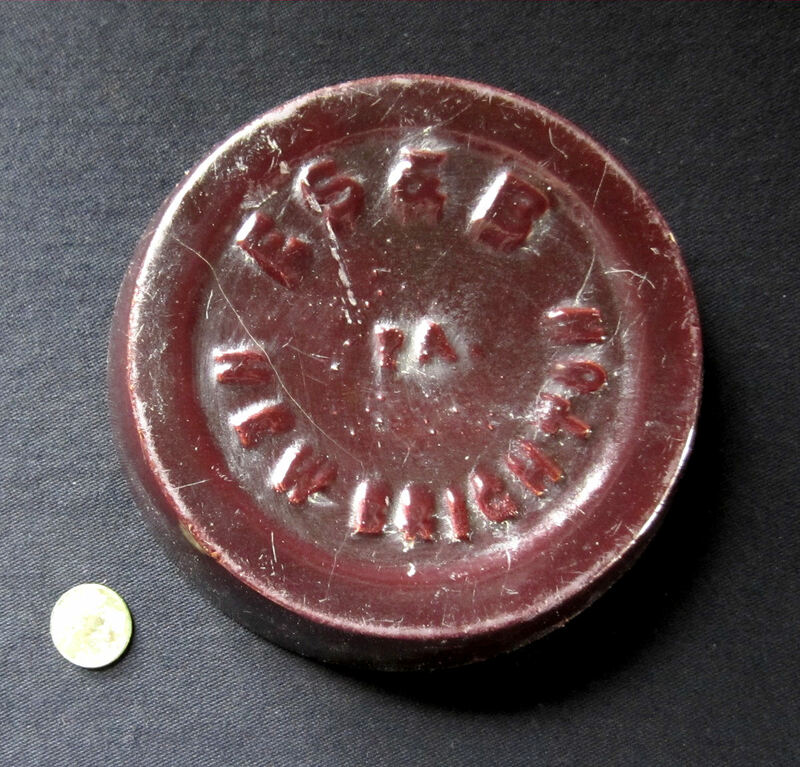 This is an 1890’s medicine. 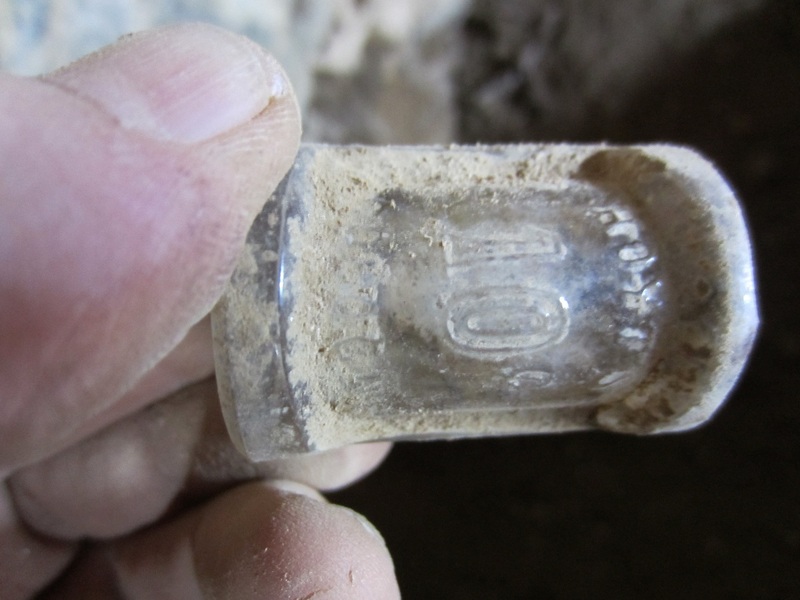 It’s what’s referred to by bottle diggers as a “slick,” as it’s not embossed and was paper labeled only. I was happy to see at least one complete item come out of the ground under there so far. 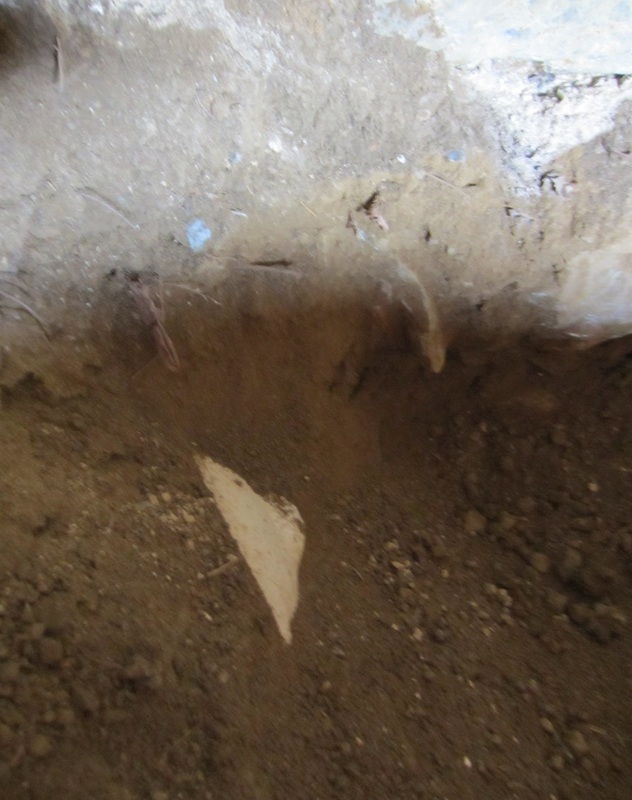 This was located in the back of the center right chamber and was only about four inches down. Though somewhat stained, it’s only damage is a little chip at the top rim. 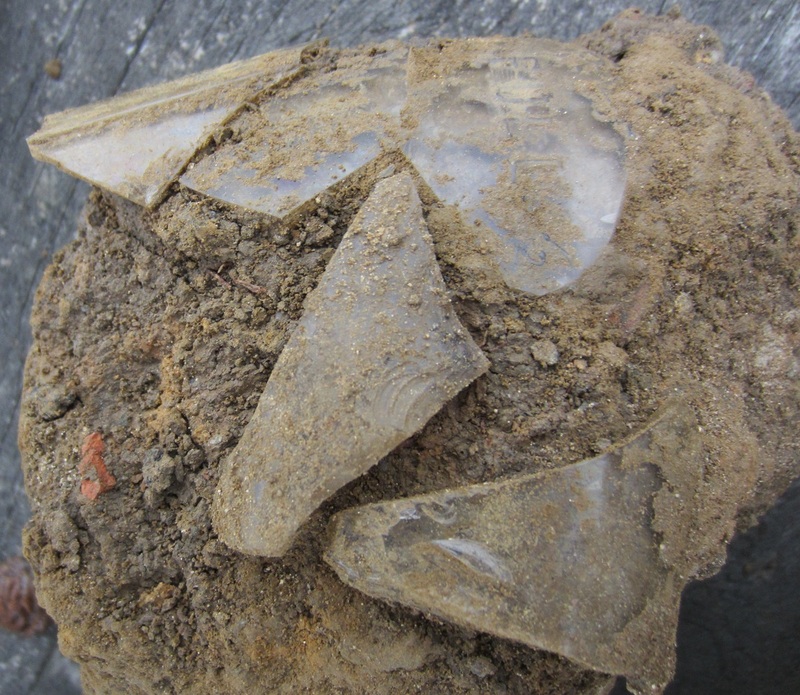 Glass was the most common of all the material I located under both sides of the porch. 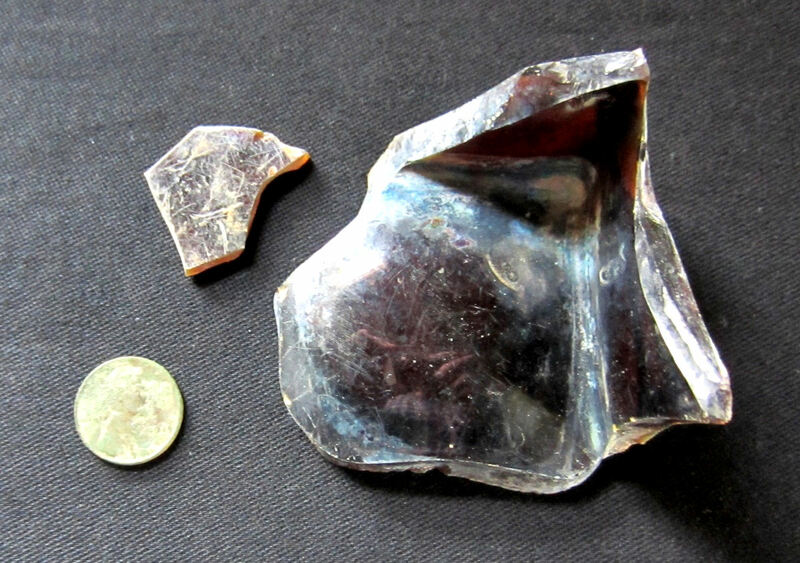 Below is shown what’s left of an 1800’s shattered Mason jar found on the right side of the porch. 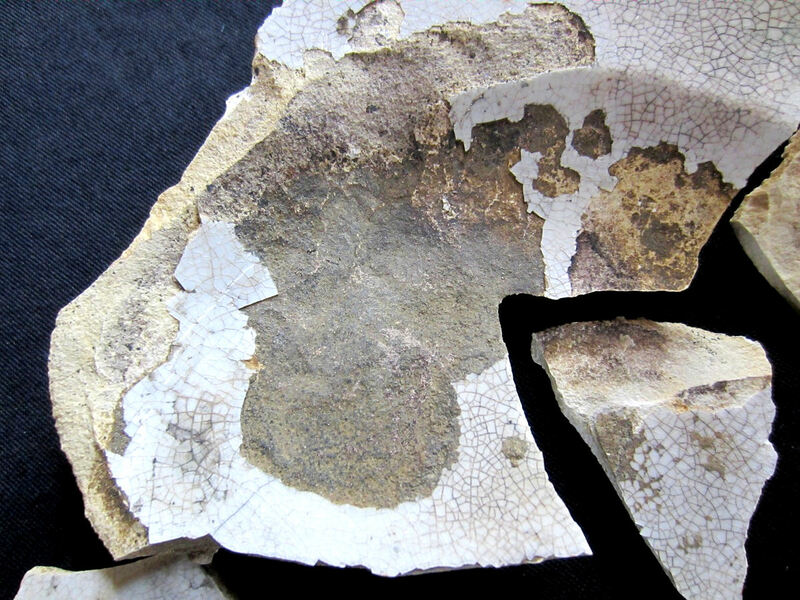 The second picture shows a close up of the embossed fragments showing letters and numbers. I should mention that there were so many aqua window glass fragments, (some four to five inches) that I began simply reburying them behind me as I went. 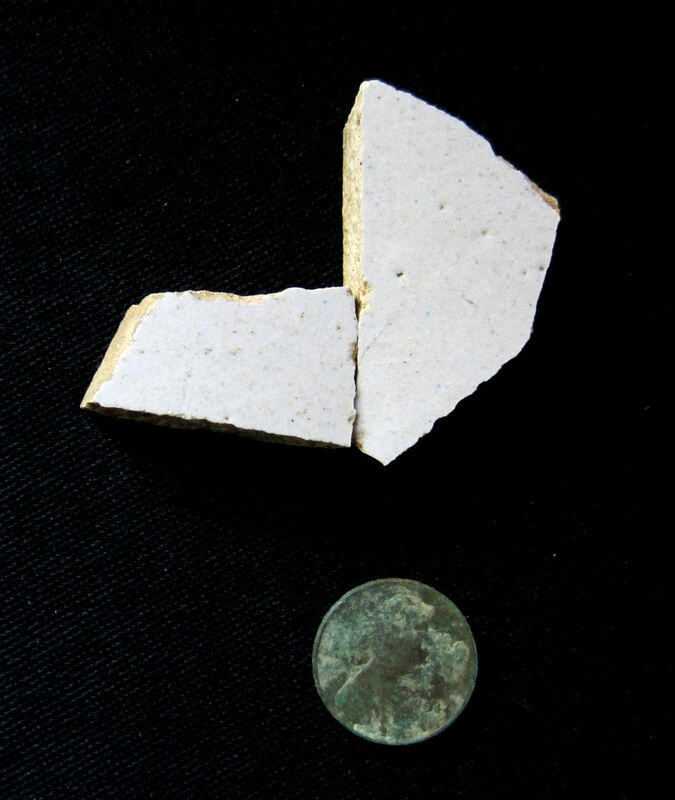 Not thick, the fragments were actually thin and were 3/16″ in thickness. I also located a cologne bottle from Lowell, Massachussetts. A Hoyt’s 10 Cent Cologne, minus the neck and top. This was on the left side of the porch and dates to the 1890’s. This first picture I snapped when it came out of the dirt, the second shows it clean. There were other fragments of bottles; a chunk of dirt with a sizeable amount of a strap flask I found on the right side as see below. 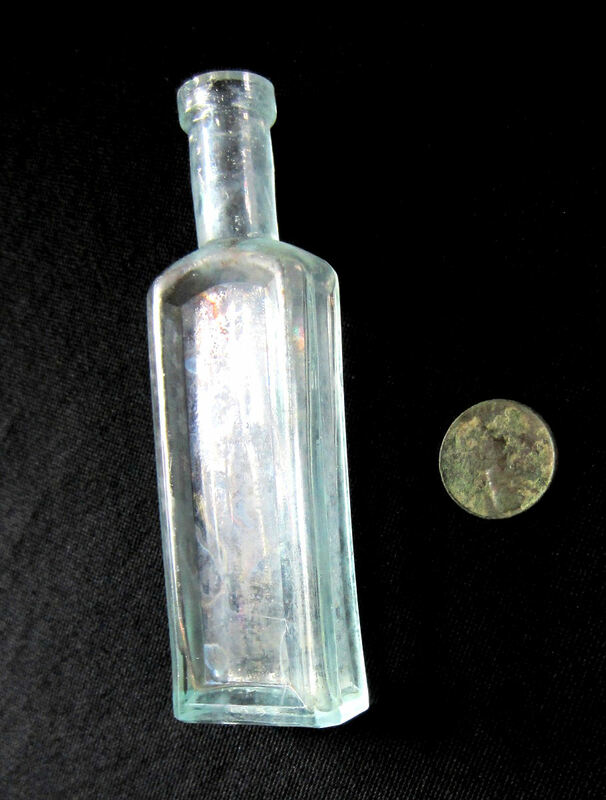 Another example of the shoulder and top of a latter 1800’s strap flask I located on the left side is shown below. It didn’t occur to see if this top fit the fragments in the matrix chunk, although it’s a possibility. The chunk matrix was a bit of a mess, so I tossed it back under the right side. 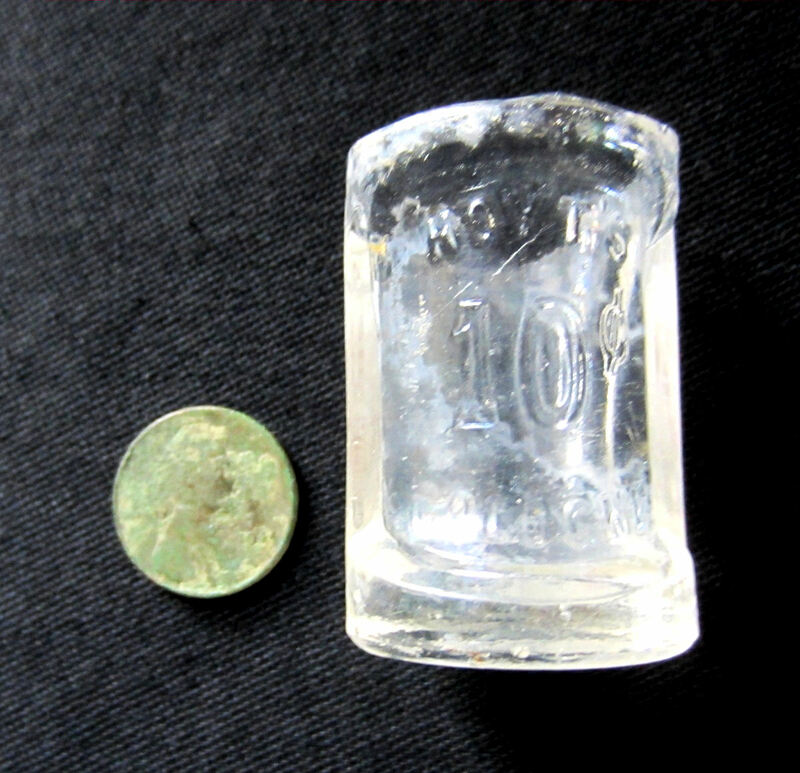 A base and fragment of a square ‘Bitters” type bottle, very thick and would have been a heavy example. Where is the rest of it? This was all I located of it. Below is shown the bottom of the base. Note thus far the only complete item I found was the 1890’s medicine bottle. Everything was fragmented and incomplete, very reminiscent of the wave and particle paradox. 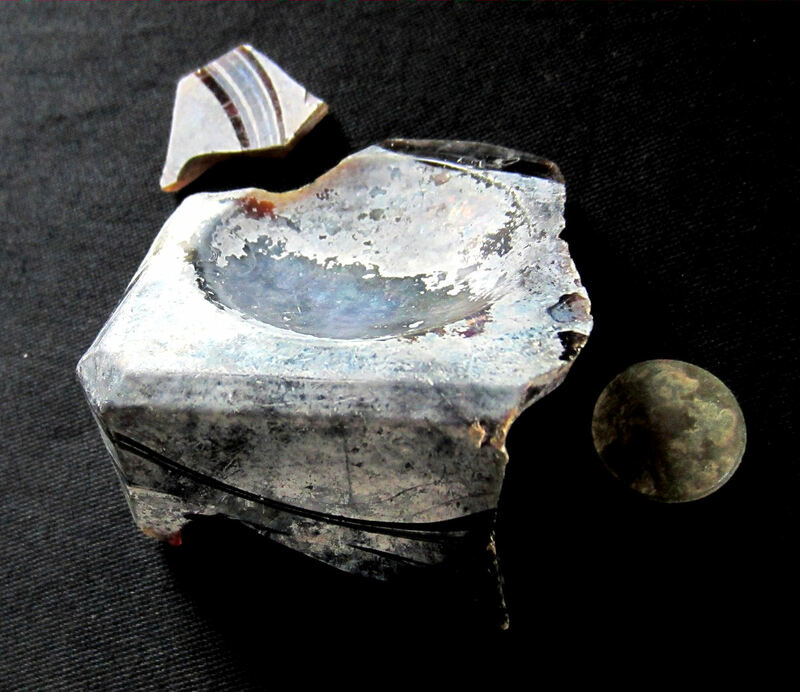 Why were there only fragments of these objects and at best, only half of them? Where were the other halves? Why only the bits of colored chinaware? Wouldn’t there be a piece found fragment by fragment that could be pieced together? 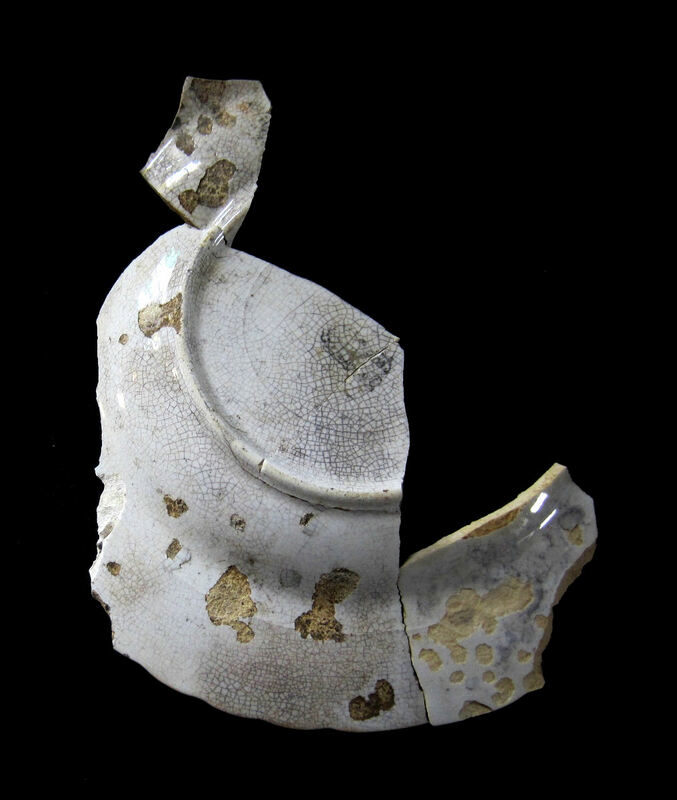 I’ve seen pictures of 1700’s glazed slipware bowls that are found in all their fragments dug from deep privies and are reassembled whole. This one foot layer of soil under my porch was completely mystifying. If items were tossed under there and even hit the back stone wall and shattered, why weren’t the entire items under there? This only deepens the mystery. On the left side I encountered this and had my camera handy to document the excavation of it. This pattern glass bowl dates from the 1920’s to 1930’s. 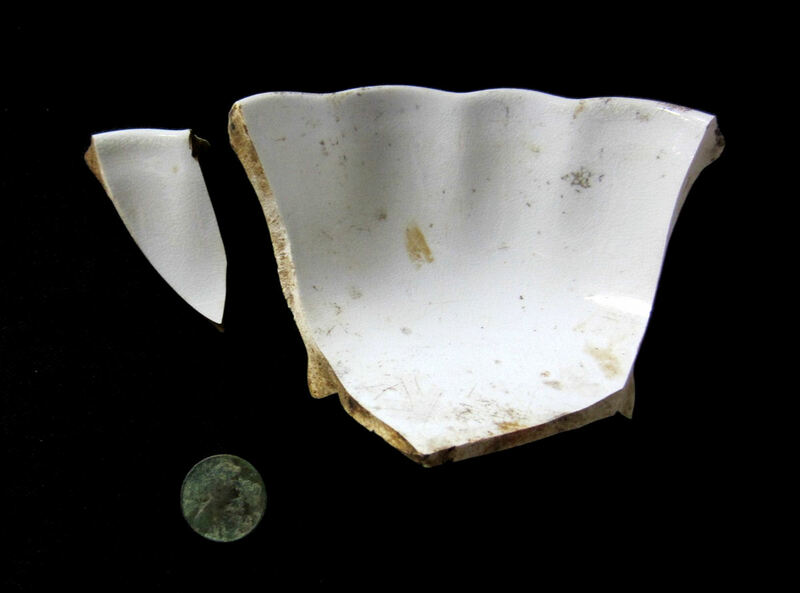 It was located about 6 inches down, not far from where the other, much older, two pieces of ironstone and china that fit to parts only found on the right side. 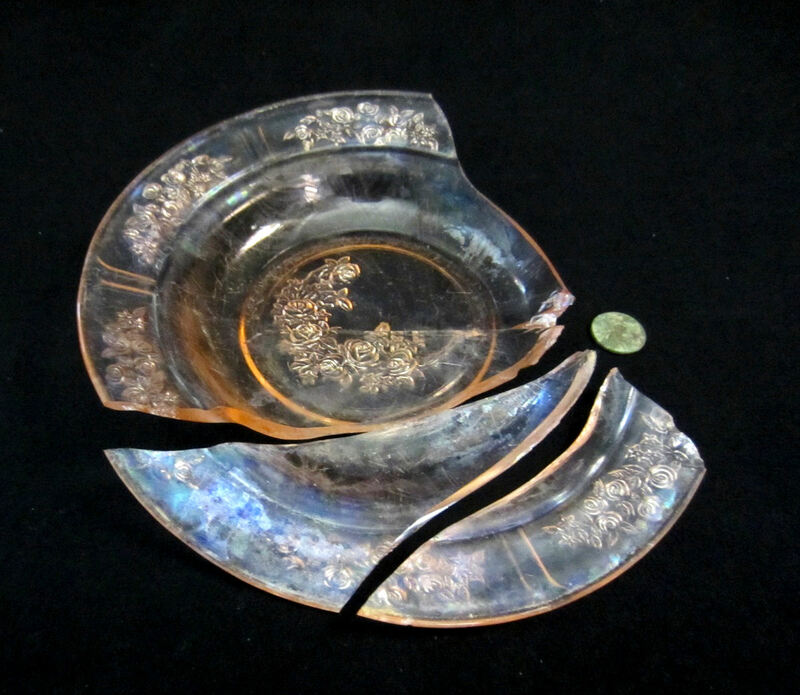 There was not a shard of this early 20th Century pink glass floral pattern bowl found on the right side. It was all in one spot, only in the left chamber. The first sign of the pink glass bowl. Lifting the first shard it out of the ground shown above. I had no idea that much more of it was to follow. Carefully smoothing away more soil, I saw more of this dish along with a bone. Most of what I found of this piece is now exposed. 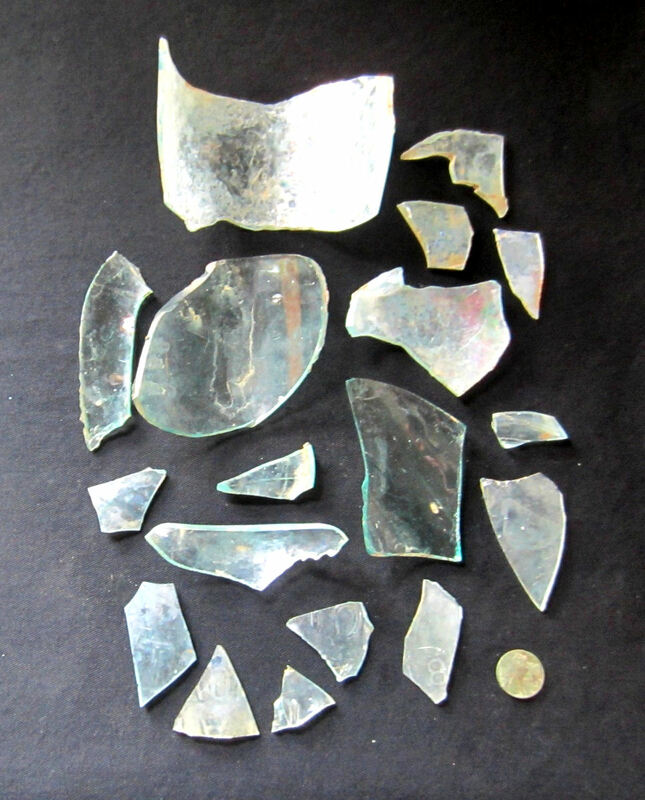 There were three total fragments of it, but as with all the other items except for the medicine bottle, it too was incomplete; not all pieces were under the porch. Where were the other parts of it? Gently lifting the main part out and having a look at it as it sat in the ground. A view of the top, it was so dirty, I first thought it was an 1800’s glass piece that was a light amethyst, but then realized it was depressionware after a closer look at the pattern. Below shows how pretty is was when made and in use. This was the most complete large piece found, but again, not all of it was under there. About 80% of the bowl was recovered. Note the impact breakpoint near the penny. Why was this all that was recovered? One theory I arrived at was when the original porch was built, for some reason or another, a foot of soil was needed and placed underneath it. 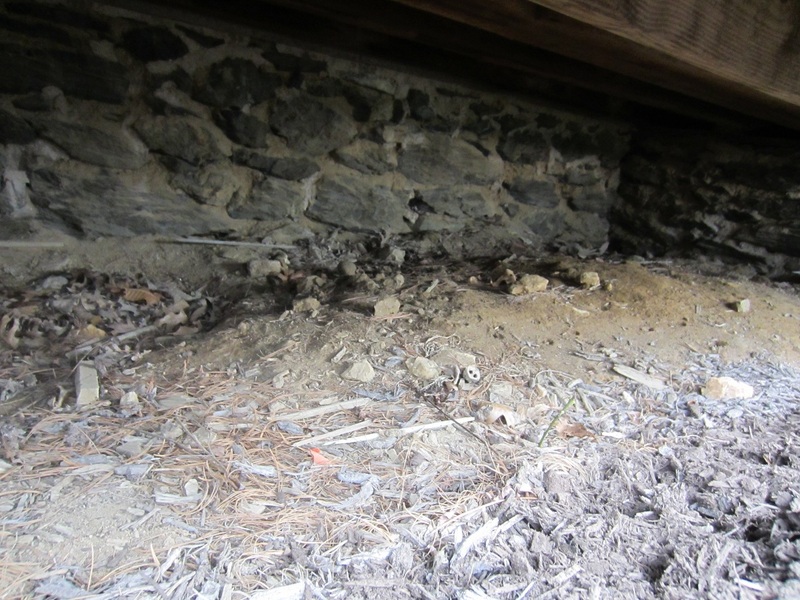 Due to what I located under the porch in all their varing incompleteness, I could surmise that the dump behind the barn was where the foot level soil fill was taken from. But that begs the question: Why would whomever needed the soil and thought the easiest place to get it from was the dump; why would the larger pieces of artifacts be shoveled under the porch along with the fill dirt? Wouldn’t the person doing this job toss back into the dump the large pieces of ironstone and glass? 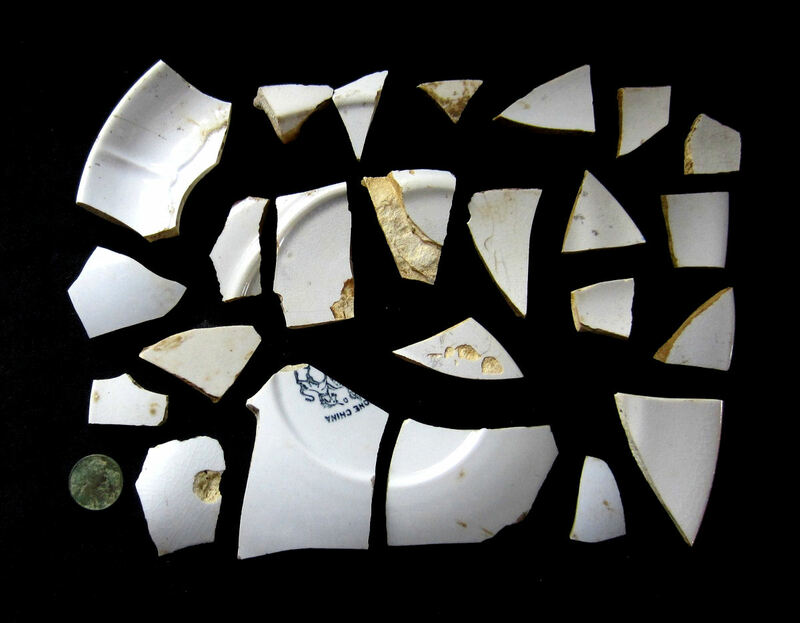 This “dirt from the dump” theory would make sense if the only pieces I found were just the small fragments of chinaware, but there were obvious tosses of large old objects under the porch that were clearly thrown there. 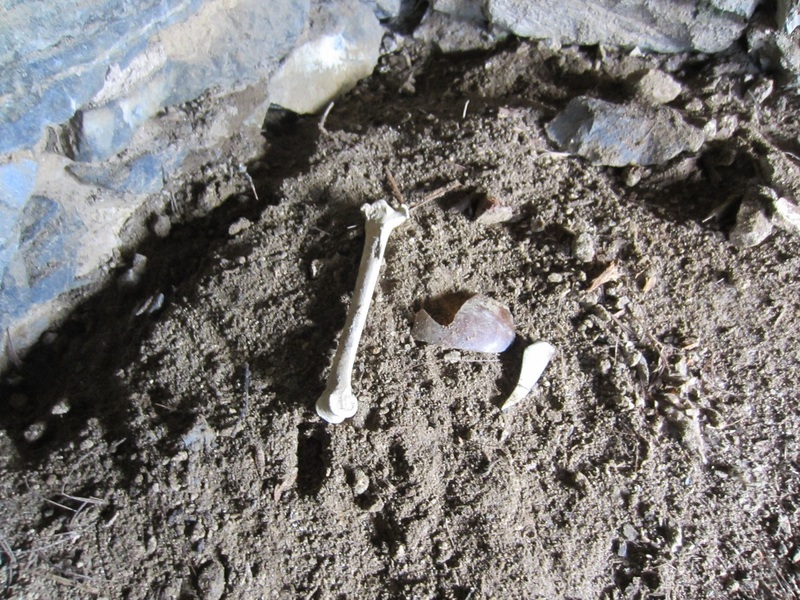 The items under the porch must have been casually tossed there over a long period of time, from the 1800’s to the era of the 1930’s depression. So, again, we’re back to probabilities. You saw it all along. The coin I used to scale size. 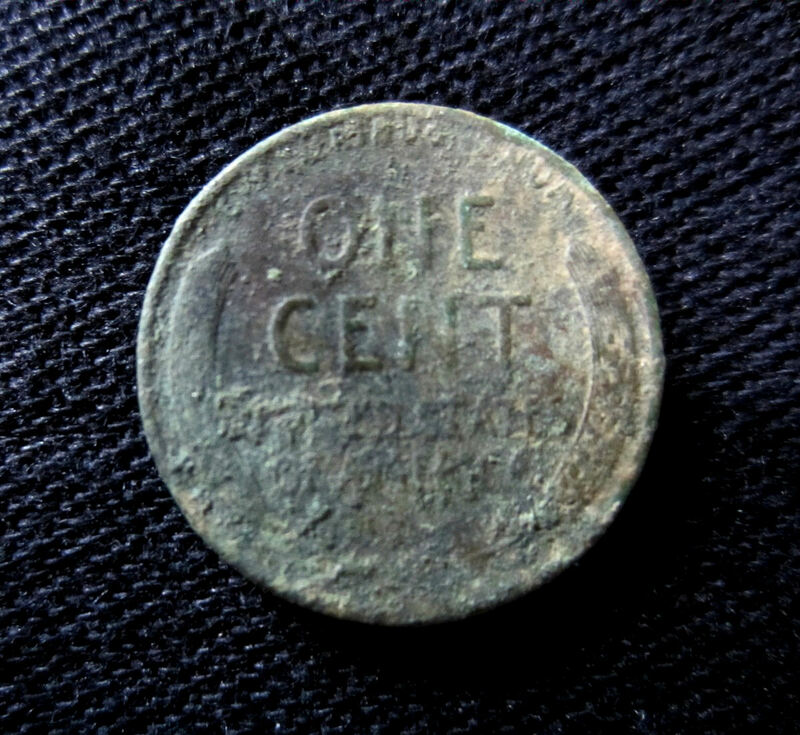 A 1944 wheat penny. Here’s a classic example of the quantum theory of Multidimensional Reality. 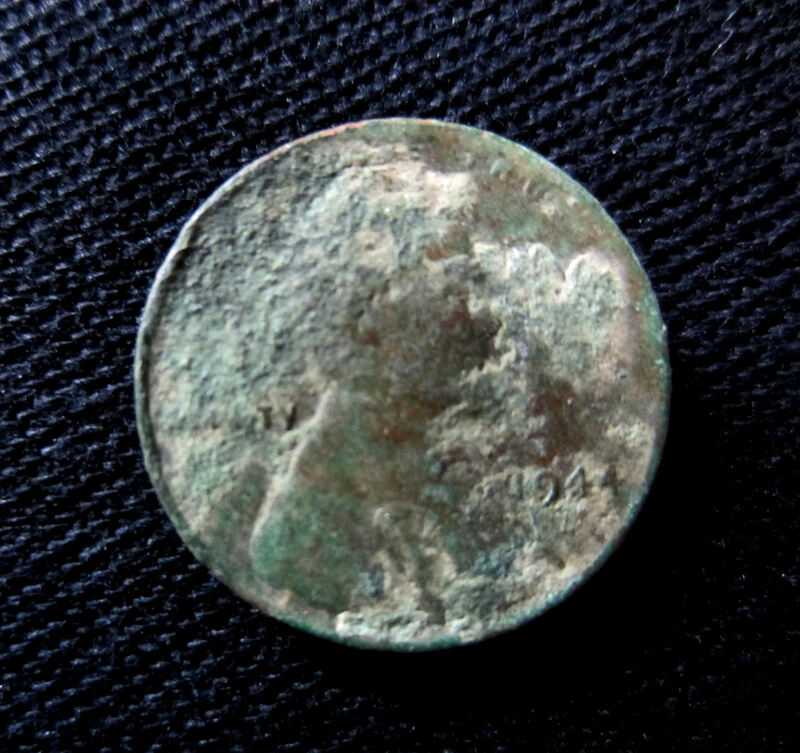 I found this penny under the left side of my porch. Where does it also exist in an alternate reality? Is it in an eight year old child’s coin collection in a blue penny binder, or, is it still in circulation somewhere? Still, those probabilities. The universe playing out every one to infinity. Like the wave and particle paradox, I’m left to only observe what was visible to me in this reality, much like the Austrian physicists trying to see the “whole” of reality and finding out we only see our own subjective definitive of a superposition. Why aren’t the rest of the items there? They are, but maybe they’re just not here. I was never good at math and barely got through algebra in high school. But maybe, in an alternate reality, I’m a jenius.